„Design meets Craft“ connects designers and artisans around the world on the first fair and transparent co-creation platform. The handicraft market is the 2nd largest labor market in developing countries and 4th in the entire world. Welcome to Design meets Craft. It is our vision to reduce poverty by empowering artisans and designers to earn a fair income with their craft skills and live a valuable life with their families. Blockchain powered technology helps to create a fair and transparent process chain for individual artisans and designers. "Design meets Crafts" provides the platform and services for every step of the co-creation process. Artisans and designers can present their skills and works in a digital showroom to find the perfect match for their project needs through an intelligent tagging system. The co-creation and collaboration process between members is managed on the "Design meets Craft" platform. Members have access to best-in-class partners for all relevant services along the process chain (e.g. administration, insurance, payment, logistics, sales, marketing, etc.). 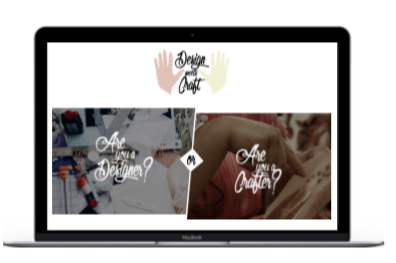 Design meets Craft provides self-service learning tools and resources created by industry experts and the global community. Through its sales platform, third-party platform integrations and sales partners, "Design meets Craft" provides local artisans and designers access to the global market. To ensure a secure and fair end-to-end process, "Design meets Craft" created an ethical code of conduct and legal standards for the community.